It goes without saying that using a utility program should provide some benefit beyond that which you can gain normally. By the same token, it shouldn't cause more work or hardship than it alleviates. Using those rules as a yardstick, NeoDesk meets the former requirement reasonably, yet sometimes falls victim to the second. For those who haven't heard of it yet, NeoDesk, by Gribnif Software, bills itself as an "alternative desktop." Loading NeoDesk after booting your ST brings up an entirely different look—the shape of the icons, the operation of disk copies, the basic function of the desktop is all changed. A simple example is the rubber-banding effect when you drag your mouse pointer. With the original desktop you can only open the box downwards and to the right; NeoDesk allows stretching of the box in any direction. Not a drastic change, but an improvement just the same. Another change—and certainly more of a change for the better—is the provision to pull program icons to the desktop. Your most frequently used files become an integral part of the desktop, and double-clicking on the icon operates just as if you had the window that contained that piece of software open and then double-clicked the program. This saves your having to open window after window (if your programs happen to reside within multiple folders) to find a program or document. Icons are more descriptive as well. 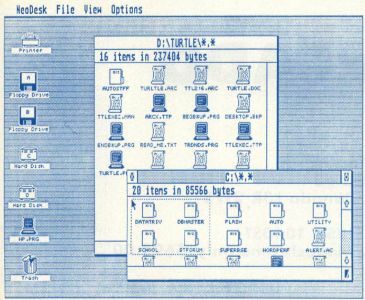 NeoDesk displays floppy drive icons, in addition to hard drive and RAMdisk symbols, making it look much different than the standard GEM desktop. Folder icons are the fanciest, appearing to have writing on them and opening up when highlighted. Also included in the package is an icon editor, for altering the icon's appearances to your own design. There is an additional symbol on the screen, a printer icon, that works hand in hand with the Neoqueue print accessory. This program, when installed, lets the user drag up to ten files to the printer icon for spooling (handy when using another GEM program), as well as select the order of printing. Windows themselves are changed also. The horizontal slider has been eliminated, with all partially displayed file icons wrapped similar to a word processor. If less than half of an icon can't be displayed in a window, it is carried to the next line. You are also permitted to have up to the GEM limit of seven windows open simultaneously. The top line of the window shows the path as with any standard window; but if you highlight a file, the information on it is shown at the top, similar to the "Show Info" selection on the normal desktop—file size, read/write status and time/date stamp. In the same respect, highlighting multiple files will show combined data on the file group. This is handy for copying files, so you'll know ahead of time how much space is required. As a negative note, highlighting a file and a folder doesn't include the folder's size in the information line, so it can be somewhat misleading; this is no improvement over the standard desktop. Copying with NeoDesk is done smartly. For example, when dragging one icon to another, NeoDesk analyzes whether the source and destination media match in size. If they do, NeoDesk may opt to copy with formatting; if not, it will treat the copy as if you dragged a group of icons to the destination drive. Copies and formatting can also be halted with the UNDO key. And while on the subject of formatting, support is in place for a few different configurations of track and sector numbers, but strangely enough, the popular Twister format isn't one of those supported. "It must be remembered that NeoDesk is simply a replacement for the desktop; its functions don't carry into other programs." If you utilize a CLI (Command Line Interpreter), you can use batch files to do some things automatically; this is similar to using a script file under Flash. If you want to accomplish a particular procedure at boot time, for instance, you can set up a batch file called NEOAUTO.BAT. Similarly, NeoDesk adds another type of file type to the list: the .BTP, or Batch Takes Parameters, file. The .BTP file is much the same as the TTP file in that you can enter a string of parameters that will be passed on at execution. Another plus is that many of NeoDesk's functions can be called with Control key combinations, to reduce the time it takes to enact a process. An example of this comes from clicking on a file or group of files with the Control key held down simultaneously, which lets you rename files quickly. Using the Shift key to pick multiple files, in tandem with the Control key, will pop through all of the files to rename them in sequence. All of this is well and good, right? Not quite. You see, with every silver lining comes a cloud—in this case, a dark cloud. For starters, the loading of NeoDesk chips away at your available RAM to the tune of 145K. That won't affect many Mega 2 or 4 users too adversely, but most of the ST contingent are using 520s and 1040s. The loss of 145K in one swoop—independent of other accessories or AUTO programs you may also use—is a major chunk, to say the least. As an aside, a few experienced ST programmers have told me that a program of this scope shouldn't use nearly as much RAM. There are certain memory wasters that were programmed in, when simpler and leaner methods could have been used. Earlier I noted the use of Control key combos to enact NeoDesk functions. Strangely, the NeoDesk information screen that normally is brought up under the Desk header of the menu bar can also be caused to surface with a Control-A. As a similar example, the sizeable custom dialogs, like the Edit Environment box or the running of a TTP/.BTP file, surely take up a good slab of silicon. And NeoDesk doesn't have any check on whether it is in place already or not, so conceivably it could be run on top of itself, at a loss of 145K each time, until you run out of RAM space. It's not likely to happen accidentally, but proper error checking would be a better use of RAM than some of the other uses. Another bug, though more obscure, was pointed out and explained by ST-LOG West Coast Editor Charles Johnson. Apparently, the SHEL__WRITE command in the AES (Application Environment Services)—the section of the operating system that oversees the menu bars, dialog boxes, windows and such—isn't handled properly by NeoDesk. This command tells the desktop to run another program when the current one is complete; for example, Easy Draw uses this function to run its OUTPRINT.PRG program when you select "Output" from the menu bar. For this reason, when you exit from Easy Draw, it does indeed drop back to NeoDesk; but when exiting NeoDesk to the regular desktop, OUTPRINT.PRG then tries to run. This results in bombs and a crash. Finally, NeoDesk has a bunch of features that frankly aren't of much use to most users. For example, the dialog box that comes up when you run a .TTP or .BTP file lets you enter up to 128 characters of parameters. You can also add one command to the parameters to have the output of these files redirected to a file or the printer. Not everyday computing aids and not very useful to all but the most dedicated power users. There is also an "Edit Environment" process that will pass information, such as paths for file locations, to another program. To date, only a few C language compilers support such a technique. With NeoDesk, you can pass up to ten environment strings from the desktop, so conceivably you could compile from the desktop. This segment of the program is only useful for those few who use compatible compilers, and even then is not likely to be used that heavily. Regardless, the feature takes up precious RAM whether it's used or not. It must be remembered that NeoDesk is simply a replacement for the desktop; its functions don't carry into other programs. Many people spend little time at the desktop level, especially with so varied a selection of desk accessories (many in the public domain, available on local BBSs that support the ST, as well as in the databases of the ST SIG on DELPHI) that remain resident, can be called up from most applications and, most importantly, duplicate a portion of NeoDesk's features. Besides, from a program that bills itself as the "complete desktop alternative," it seems strange that it doesn't support low resolution usage. Other limitations—which Gribnif acknowledge—actually serve to make NeoDesk less than the original desktop. A few examples are the ceiling of 18 icons you are limited to having on the desktop at once, a maximum of ten file icons that can be put on the desktop, and, most restricting, the condition of not more than 112 viewable files in a window. On top of that, many seasoned ST users find that icons are onerous and clumsy, so they've switched to text mode to display window contents. Unfortunately NeoDesk, in its initial incarnation, doesn't support a text mode. The reason I say "initial incarnation" is because Gribnif Software's Mike Cohan, Rick Flashman and Dan Wilga noted in a DELPHI conference that a new version would be released in the fall to pacify some of the critics by adding many features—text mode among them. Of course, the additions would expand the RAM grabbing; but in their defense, they also intend to have a configuration accessory that would enable the user to minimize the memory usage to only those functions that are needed. Granted, the previous description doesn't describe all that NeoDesk is capable of, and $29.95 is certainly a small sum to pay for the noble effort Gribnif has undertaken. If you collect ST utilities religiously, then by all means pick up a copy. Personally, I see it as a program that you'll use a few times, then put on the shelf. If you do plan on buying it, keep in sight that it doesn't come without its negative points, coupled with the fact that Gribnif is planning on a substantial upgrade (which may not be out by the time you read this). As always: caveat emptor, let the buyer beware.